By Gerry Gillespie, Zero Waste Australia. Following up on this blog post, Gerry Gillespie digs deeper on using the plastic bag as inexpensive collection infrastructure for local compost systems. Marikina was not the first community to try a recycling program fueled by plastic bags. In a trial conducted in New Zealand in 1998, called Tag Bagtm, households were asked to use the standard plastic shopping bag to separate their domestic waste into four categories. They were given a simple sheet of instructions and asked to separate their waste into paper, recyclables, organic and residual waste. The bags were sealed with blue, yellow, green or red tape, depending on its contents and placed together into a single collection bin. The bin contents were collected by a single truck and separated into their categories at the recycling station. Contamination from one material stream to another was minimal. 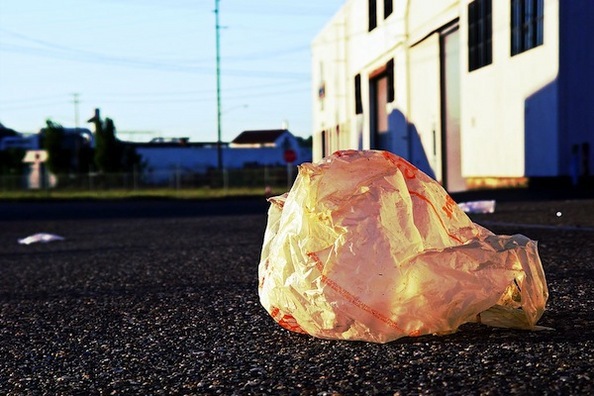 This trial had proven that the worst characteristic of the plastic bag, its environmental permanence – had made it the perfect piece of infrastructure to source-separate waste. Once the plastic bag is used to collect waste materials, the bag itself is also captured for recycling or reuse. All human populations produce organic waste suitable for composting in the growing, processing and preparation of food and to some extent, in food scraps after meals. This same organic waste, when it degrades and rots, presents health problems for local communities when it is dumped near communities. When waste is present in market places and in close proximity to populations, it attracts vermin and associated disease. In Curitiba, Brazil, the problems caused by waste in slum areas were addressed by a program, where the poor exchanged plastic bags of waste for food at government drop-off points. The net effect was a dramatic fall in community health costs due to the removal of organic waste. Could it be possible to expand this type of program into any area where organic waste is causing health issues and wasteful plastic bags are present? While it may not be possible to collect and sell recycled materials in some parts of the world, it is always possible to compost at any scale. While organic material makes up more than half of the waste stream in most ‘developed’ countries, regardless of its quantity, compost can be processed through simple composting or worm farming in a small, enclosed area. If people were given the ability to collect organic waste and compost it at no cost other than their labour, the end product could be very beneficial to the community. Compost could help grow food in local communities, especially in areas with limited space in pots, tires, broken buckets and small garden beds. Compost bins don’t need to be fancy bins; they can be made from ‘puddled’ mud, cement or clay bricks, mattresses, rammed earth, straw bales, old mattresses held in place with wooden sticks or poles, bundles of newspapers, logs or stones. Composting can provide the opportunity and the empowerment to people to grow their own food at a most elementary level. By focusing the compost process on food production as a community benefit rather than composting as a waste reduction tool, it becomes impeccably clear that all things on this planet are resources, even plastic bags. Photo by: Flickr user Kables, used under a Creative Commons license. Copyright © 2019 The Organic Stream. All rights reserved.